We’ve all been there - after holidays or a trip to see the family, birthdays, or just a culmination of bad habits like comfort eating, after-work tipples or junk food snacks and we end up feeling less than healthy. 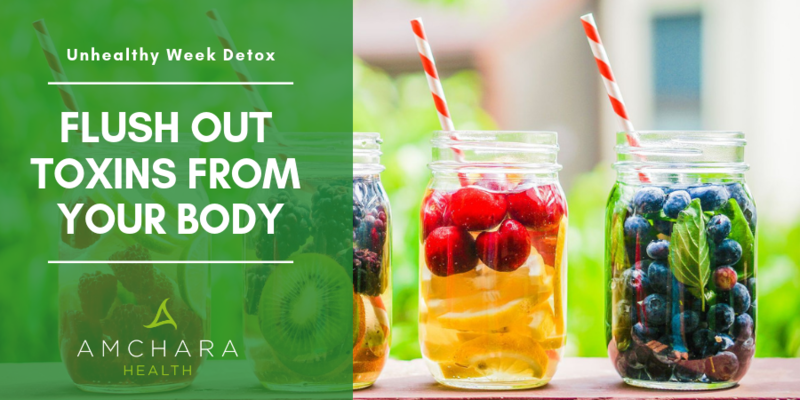 If you’re familiar with those grotty feelings of overindulgence like bloating, fatigue, dull skin and a foggy head, have you considered a detox? How Will I Feel during my Detox? The aim of a detox is to expel toxins and waste products from the body. We can’t avoid toxins as they are everywhere. Fertilisers, pesticides and antibiotics used in farming, marine pollutants in fish and seafood, chemicals present in water and the air and even natural substances present in food are all toxins. During metabolism our body even naturally produces toxins itself. 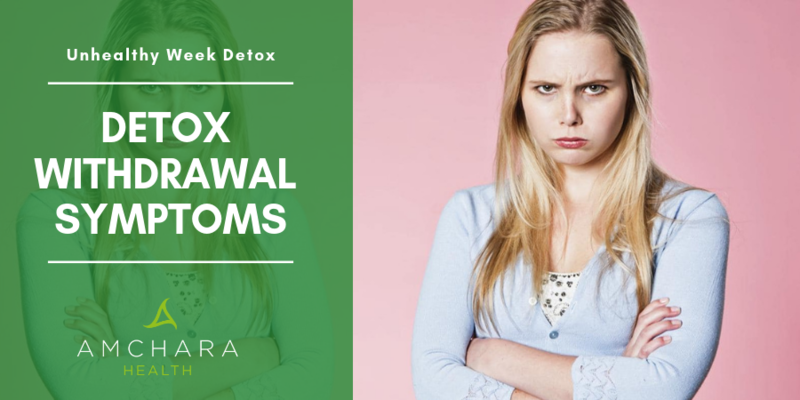 Toxins can also be emotional, such as negative thought patterns, self-criticism and self-sabotage, chronic stress, or adverse experiences you haven’t moved on from. Our bodies constantly detox thousands of substances every second of every minute of the day and have developed clever waste disposal systems to do this. However in today’s world with exposure to so many toxins from all over the place, the body’s detoxification processes often can’t keep pace. When toxins accumulate in the body, eventually we can start to experience health problems such as low energy, digestive problems, poor immune system, hormone imbalance and difficulty concentrating. The aim of a detox is to give a little support to the body by reducing this daily bombardment of toxins. It can get down to the job of expelling the toxins your body has stored. Think of it as a good spring clean when you dust behind the telly and sofa and all those other cleaning jobs you don’t have time to do on a weekly basis. The liver is our main organ of detoxification. Its job is to remove toxins from the bloodstream before they can do any damage- a bit like a nightclub bouncer or a security guard. The liver has an array of other functions too, but even though it’s a really overworked organ, it’s capable of recovering even after years of abuse. The liver shunts toxins to the colon or large intestine where they are expelled via the faeces. It’s important the colon moves regularly, otherwise these toxins can be reabsorbed back into the bloodstream and would the need to be processed by the liver over and over again. Kidneys filter toxins out of the blood and expel them in the urine. Our skin and breath are also used as a route to expel toxins, although much less so than the other organs. Any detox programme will have one main aim, to reduce the amount of toxins taken in through the diet. It will also provide the body with plenty of vitamins, minerals and antioxidants known to support our detoxification processes. Dietary changes can seem daunting and it’s hard to stick to a strict diet long-term if it’s very different to the one you’re used to. Ideally, then, start small and make manageable changes. 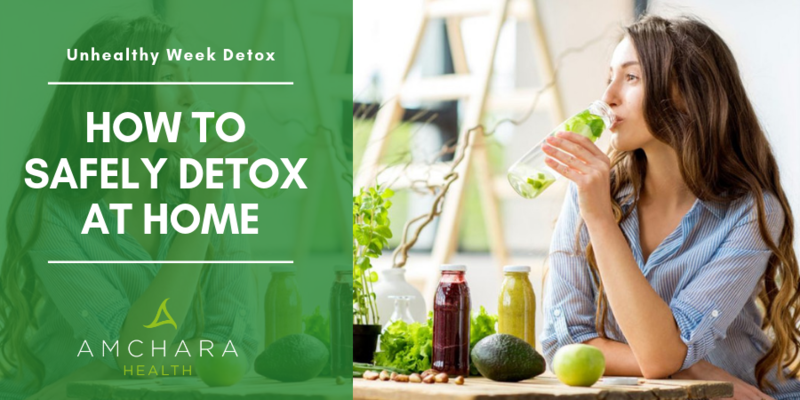 Many people find a short at-home detox is great to establish healthier habits and provides the motivation for a jump start to a change in diet. The liver detoxifies substances in a two-stage process. Often it produces an intermediate chemical after the first stage which needs to be neutralised before it’s excreted. Sometimes that chemical is actually more toxic than the original substance. 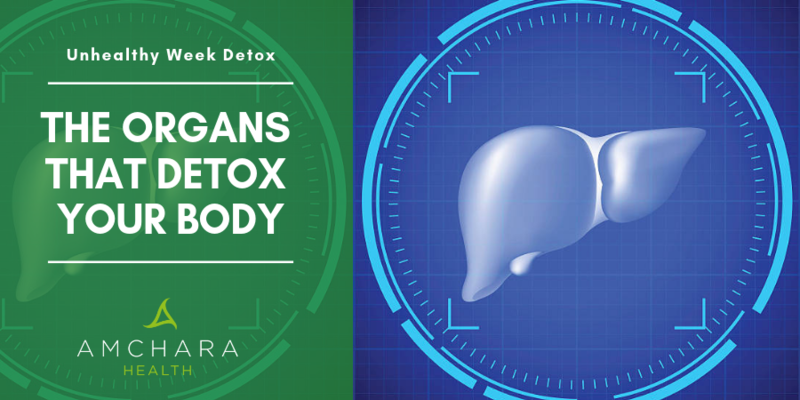 So it’s crucial the second stage of liver detox keeps pace with the first stage, otherwise the intermediate chemicals can build up and harm our tissues. This is partly why we can experience so-called detox symptoms like headaches, skin rashes and generally feeling unwell. In this detox we’ll make sure we include plenty of measures to minimise detox symptoms. So why not set a date to allow your body to do some much overdue housekeeping and cleaning in the comfort of your own home? It’s just 48 hours of your life, but you’ll feel the positive effects for far longer. You’ll need to do a little preparation for your at-home detox. For most people, it is best done over a weekend, but any two consecutive days is fine. First, set the date in advance. It’s best if you have a quiet weekend with no social engagements or work. If you have family or a partner, you’ll need to tell them about your plans and that you won’t be around for them too much over the weekend. Point out how important it is to you that you do this and ask for their support. Better still, encourage them take part too. De-junk food your cupboards and fridge. Ideally, reduce your intake of coffee and alcohol for a few days before your at-home detox. Make sure you’ve no household chores waiting to be done. That way you can devote time purely for you. Processed foods, so anything out of a packet or tin. That way you’ll avoid preservatives, colourings and flavourings which all need to be detoxified by the liver. Refined carbohydrates, sugar and sugar substitutes, cakes or biscuits. If you crave something sweet, have fruit or a date, and use honey or agave syrup to sweeten drinks if necessary. Caffeine or alcohol. No morning coffee allows you to wake up gradually and naturally and not be jolted awake by caffeine. Grains – wheat or anything containing it, barley, rye, corn, oats or rice. No bread and crackers, even ones marketed as healthy. Dairy – milk, cheese, yogurt or butter. Salted nuts and all peanuts. Don’t be daunted, there are still plenty of delicious foods for you to enjoy. During your detox, you’ll be emphasising nutrient-dense foods with plenty of fibre to keep the bowels moving and the liver in tip-top form. Plenty of vegetables, in particular dark leafy green vegetables which provide fibre, vitamins, minerals and antioxidants. Cruciferous vegetables – broccoli, cauliflower, kale, cabbage, bok choi and brussels sprouts, which assist with liver detoxification. Fruit. (Fruit juices are high in sugar and best avoided). Berry fruits are especially high in antioxidants. Wild-caught oily and white fish, lean chicken and eggs to provide protein. Unsalted nuts (apart from peanuts); seeds like pumpkin, sunflower, flax and chia seeds. Legumes such as peas, beans and lentils are a useful source of protein. Choose organic food wherever possible, as it won’t have been sprayed with pesticides and herbicides. Organic chicken is not routinely given antibiotics. Foods that are particularly beneficial for our detox systems include garlic, onions, parsley, turmeric, beetroot and artichokes. Start each day with a mug of hot water with lemon and fresh ginger. Drink lots of pure filtered water! You’ll need to flush out those toxins. Sip it gradually throughout the day rather than glugging it in one go. Green tea is great as it contains antioxidants which neutralise free radicals. Don’t go overboard, however as it does contain some caffeine. Herbal teas, especially ginger tea which is great for combatting nausea and peppermint tea for calming the stomach. Nettle and dandelion teas can support the liver, while milk thistle tea is perfect for extra detox support. Chamomile tea before bed helps ease you into sleep. Beetroot juice contains tons of antioxidants to support the liver. Treat yourself to a turmeric latte . Combine turmeric, black pepper, cinnamon and ginger for a warming comforting hot drink. Use coconut milk to make it super creamy. If you have a juicer, green juices containing spinach, pineapple, cucumber, celery, lemon and kale contain masses of nutrients to support your detoxification systems. Many people swear by apple cider vinegar, which has been used to cleanse the body for thousands of years. Use unpasteurised apple cider vinegar which has the cloudy bits in it (called the ‘mother’). Mix 1 tablespoon with 100ml water, plus some organic honey. Drink up to three times per day. You’ll have plenty of time over the weekend to devote to helping your body detox both physically and spiritually. The main thing to do is relax! Don’t stress about the detox, or if you’re doing it right. This is time for you and you alone – and it’s meant to be enjoyable. Don’t beat yourself up if you lapse. If you do, you’re more likely to give up completely. Instead, move on and do something positive. Congratulate yourself on what you’ve achieved and remember that even though there’s no quick fix, even a short cleanse can retrain your taste buds and give you that impetus to make small changes towards a healthier life. Mindful eating means paying full attention to what you eat – the taste, flavour and texture. Only eat when you’re hungry and stop when you’re full, rather than when your plate is cleared. Concentrate on chewing each mouthful thoroughly. Schedule in a massage – ideally a deep tissue or a lymphatic drainage massage. Choose a therapy centre close by to minimise travel time, or ideally have the therapist treat you in your home. A session in a sauna or steam room will encourage removal of toxins by sweat. Your local gym or swimming pool will often have these facilities. Bikram yoga, otherwise known as hot yoga combines heat with circulation-boosting poses and will definitely make you sweat! Aim to include some gentle exercise each day. Walk outside for 30 minutes each day if possible. Yoga and tai chi are great. Practice yoga first thing in the morning – it’s perfect for toning the digestive system, it releases tension in the upper back and neck and calms the mind. Dry body brushing is excellent to stimulate the lymph system and eliminate toxins through the skin. Use a brush with natural bristles. Work in circular, upward motions, starting at the ankles, always brushing towards the heart. Don’t use too much pressure, and don’t brush over broken or inflamed skin. Follow with a warm shower to further boost your circulation. Meditation is great for rejuvenating the body and the mind and is a wonderful stress-buster. Start with just 5-10 minutes if you’re new to meditation. If you have difficulty meditating and get ambushed by thoughts, boredom or feel restless, this is a sign that you are releasing stress, so don’t give up. Let the thoughts go and return to the focus of your breath. To further relax, try deep breathing exercises. According to Dr Weil , mindful breathing is calming, energising and can help with stress-related health problems. The 4-7-8 exercise involves inhaling through your nose to a mental count of four, holding your breath to a count of seven, and exhaling audibly through your mouth for a count of eight. Write a journal to work through any negative emotions. According to traditional Chinese medicine, the liver is connected with anger, so you may find as your liver releases toxins, pent-up anger or other emotions are released. It’s a good idea to combine your physical and emotional detox with a digital detox. Decide to withdraw for a short time from the relentless flood of energy and information that can overload the mind. Don’t check those emails, hide your phone, switch off the TV. Avoid social media contact if you can bear to. Tell friends what you’re doing in advance so you won’t worry they’re trying to contact you. There’s always your landline if anyone needs to contact you in an emergency. Instead of surfing the net, read an uplifting book or listen to relaxing music. Try to get enough sleep – aim to be in bed by 10pm. Before bed, have a warm bath with Epson salts and relaxing oils like lavender, and treat yourself to some candles around the bath. You could ease yourself into your detox on the day before you begin by reducing or cutting out sugar, wheat, dairy and processed foods, and have a simple dinner of chicken or fish and lots of veggies. Breakfast: Quinoa pudding (quinoa is a seed, not a grain) made with coconut milk. For even more zing, add grated ginger. Serve with berries. Lunch: Turmeric Broth with added lentils, parsley, spinach, chopped cauliflower and sweet potato. Dinner: Lean grilled chicken breast, with swiss chard or kale stir fried in coconut oil with garlic and ginger. Serve with a big salad with flax oil and apple cider vinegar dressing and a dollop of sauerkraut or kimchi. Breakfast: Berries and pumpkin, sunflower and flax seeds, with Dr Oz’s kale, pineapple and ginger detox drink . Lunch: Salad with kale, thinly sliced red cabbage, broccoli florets, grated or spiralised carrot, diced avocado, walnuts and sesame seeds. Use flax oil and lemon juice dressing with grated ginger and wholegrain mustard. Sprinkle parsley on top. Dinner: Wild caught salmon baked with a glaze of grated ginger, finely chopped garlic and pomegranate juice on wilted spinach. Sprinkle a few pomegranate seeds over the fish about halfway through cooking. Serve with roasted brussels sprouts, broccoli, cauliflower and beetroot. Snacks on both days: Vegetable crudites, fresh fruit, nuts and seeds, miso soup. After your detox, you’ll most likely be feeling great – with more energy, brighter eyes, glowing skin and a clearer head. You might want to carry on – but bear in mind this type of diet is meant for the short term only. However, there’s no problem with following an amended version of this diet on an ongoing basis which allows occasional grains, but no gluten, along with a small amount of dairy in the form of grass-fed butter and yogurt. If you’re ready to stop, transition gradually as your body will appreciate time to adjust. Don’t pig out on a fry up the very next day! Think about how you can amend your usual daily routine to bring in a few more healthy habits, like scheduling in meditation or eating more green leafy vegetables. Taking away sugar and junk food may cause withdrawal symptoms and cravings, particularly as your blood sugar starts to adjust. If you habitually drink lots of caffeine-containing drinks, you may experience caffeine withdrawal headaches. At the outset of your detox it’s common to feel headachy, nauseous, fatigued or achy. Your skin may become spotty or dry. You may sweat more or pass water more frequently than usual. Your bowel motions may alter. These symptoms should subside, however. They aren’t dangerous, but as always, if you have any health concerns do speak to your GP. If you enjoy your detox and want to move further on your health journey, or if an at-home detox is not for you, a stay at an Amchara Retreat may be just what you need to provide you with the guidance and support you need to ‘Change for Good’.